It’s the most wonderful time of the year!!! Yes, it’s my favorite time of the year! I love the excitement you feel during the holidays, the anticipation and the preparation. I love it all! You have probably come from Stephanie Kolker’s wonderful blog project. Isn’t it lovely? Use the NEXT and PREVIOUS buttons below to go back to the previous blog and to go to the next blog. And check out our first ever blog hop giveaway at the end of this post! Last Saturday I had my 5th Annual Holiday Stamp Camp (it was awesome!) and here are two of the projects we created. My group of loyal stampers had a wonderful time and the food was pretty good too! Both of these projects are CASED (copy and share everything) from other Stampin Up demonstrators. The luminaire was CASED from Jan B and the Sleigh Ride card was CASED from Meg Loven Stamps but they both were so beautiful, I couldn’t resist. Thanks ladies! The Sleigh Ride card was so easy to make. It’s actually a 4 1/4″ by 4 1/4″ square card which will still fit in our SU medium envelopes. I used a 2″ circle punch for the inside of the silver metallic doily on whispher white and basic gray cardstock. 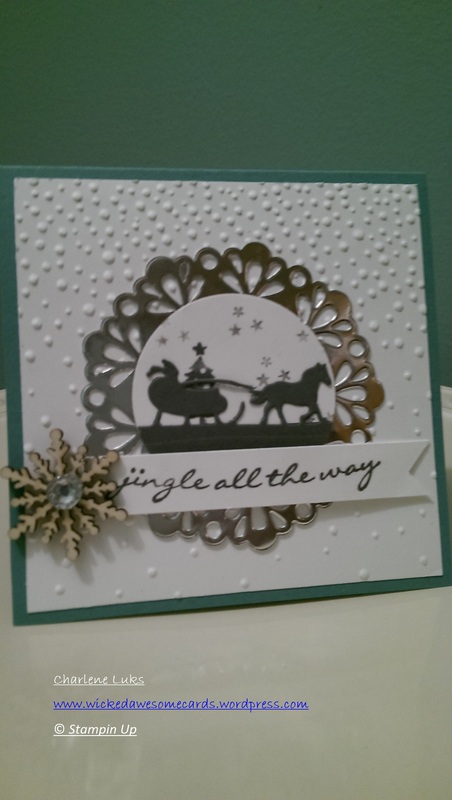 I put the basic gray card stock circle through the Bigshot with the sleigh and reindeer edgelit die. I embossed the whisper white background piece (4″ by 4″) with the Softly Falling embossing folder. I stamped Jingle all the way in basic gray ink and added the wooden Snowflake Elements and an Iced Rhinestone to complete the card. Below is the beautiful luminaire we created at the Stamp Camp. Some of the stampers used red foil and some used gold foil for the ornaments. I gave them all a flickering battery operated candle for the inside. What a festive item to add to your holiday mantle or table. The base of the luminaire is made from the Irresistible DSP that came out in the Spring 2015 catty. The stars and swiss dots were the perfect touch for this luminaire. 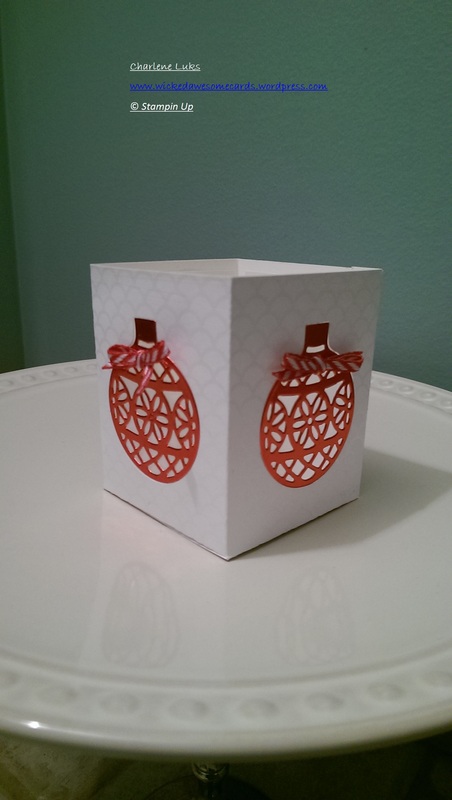 Four pieces of velum cardstock were used behind the foil ornaments that made this piece look like frosted glass. The 1/8″ red striped ribbon was tied into a bow and added to the top of each ornament. Here are the measurements that Jan B has provided. The 4 pieces of velum for behind each ornament are 2 3/8 by 3″. 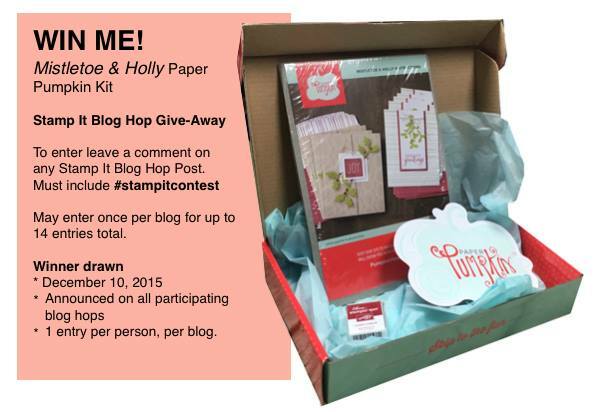 And don’t go away, because Team Stamp It is announcing it’s first ever Stamp It Blog Hop Give-away!!!! In order to enter, please leave a comment on this blog hop post and every blog post in this hop and make sure you reference ‪#‎stampitcontest. Thanks for stopping by! Press NEXT to move on to Karen Page’s blog for another awesome Holiday project!!! Clever use of the ornaments, very pretty luminary. So delicate and ornate looking. I also thought adding the little scene to your doily was a very cool idea. #stampitcontest The card is cute & the luninary is a great idea. Love the ornament box that you made. I thought those ornaments were so large but I have seen two beautiful uses on these blogs now. #stampitcontest- love your cards and use of Sleigh Ride.